Behind the ivy-clad walls of an English boarding school, lurks a sinister web of corruption, scandal, and conspiracy. Also entangled in the disturbing turn of events is the enigmatic Kieran Storm - a fellow student with a killer intellect and a body to die for. He's heading for trouble and taking her with him. Raven can feel herself falling in love, but can she trust a boy she knows almost nothing about? This is the first book I've read by Joss Stirling and to say that I'm impressed would be an understatement. I really wasn't sure what to think when I received this for review, but when I realised it's set in a boarding school I knew I was probably going to like it. When I was little I was obsessed with books set in boarding schools and I wanted to go to one (not now though. Not a chance.) This book was like going back to my childhood except with a YA book and I devoured it! Raven Stone's parents died and so she had to move to England to live with her grandfather, the lowly caretaker (janitor) at the prestigious boarding school Westron. At the school with a scholarship, Raven is seen as inferior to the other students - royalty, celebrities or the children of famous people - who paid to get in. Because of this, they bully Raven. She can't help but feel exposed without her best friend Gina by her side, who mysteriously went missing in half-term. But then Joe and Kieran turn up and that is when things start to get really interesting. Raven seriously reminded me of Maia from The Mortal Instruments series by Cassandra Clare; they were almost exactly the same. Raven has trust issues, she's sassy and she isn't afraid to stand up for what she believes in. Generally she's just really cool! I also liked Joe and Kieran. They both bought lots of humour to the book but in different ways; Joe with his charm and Kieran with his awkward but endearing personality. 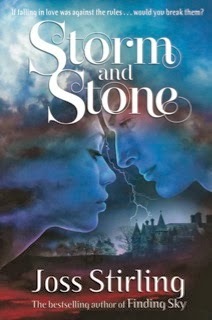 'Storm and Stone' (what an awesome title, by the way) is fast-paced and action-packed. It's sure to be a hit when it's published! I was hooked until the very end but I would have loved to see more Raven and Kieran time! This is a fantastic book that will keep you guessing and you won't want to put it down. I love books by Joss Stirling so this is high on my wish list and your review makes it sound fab! I need to read Joss Stirling's books so badly! I've heard nothing but good things about Storm and Stone. I remember talking to you and Charli and you were both fangirling about Kieran :D yay for awkwardly endearing! I'll definitely keep my eyes peeled when this book is published. Great review, Amber! You do! I think you'd love this. Thanks Zoe! Ooh I'll keep an eye out for it. Thanks Orli! Cool review, sounds like an awesome read! This sounds right up my street! I have read Finding Sky by Joss Stirling and really liked it - it was kind of the reverse! A British girl goes to school in Colorado, though it isn't a boarding school! You should definitely give it a try! I can't wait to read it! I'm the same! I love books based at boarding schools. I haven't read one of his books either so I don't know what to expect but I definitely want to look out for this book. Sounds right up my alley!